July is always a special time for AASA. Hundreds of superintendents across the country—some of the sharpest minds in public education—gathered in the nation’s capital last week to discuss some of the most critical issues in public education as part of our annual Legislative Advocacy Conference. The meeting marked three days of invaluable conversation focusing on such hot-button issues as school safety, appropriations, career and technical education, the Higher Education Act, teacher shortages, IDEA and Medicaid. AASA members—individuals I often refer to as “champions for children”—made their voices heard by visiting members of Congress from their respective districts and states to share opinions on these important matters. One-on-one interaction with our federal policymakers is important because over the years, AASA has developed a reputation for being an influential player in Washington, D.C., when it comes to education policy. We owe that in large part to the expertise of our members—exceptional leaders who have taken our organization to great heights and have been very instrumental in maintaining our reputation as one of the leading advocacy groups in the nation. 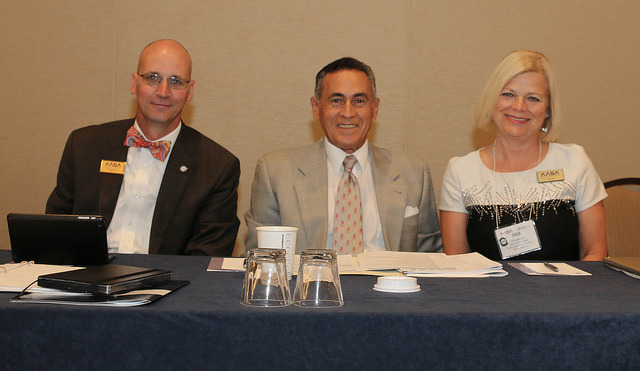 As part of our conference, AASA was proud to welcome new members of our governing board and executive committee. 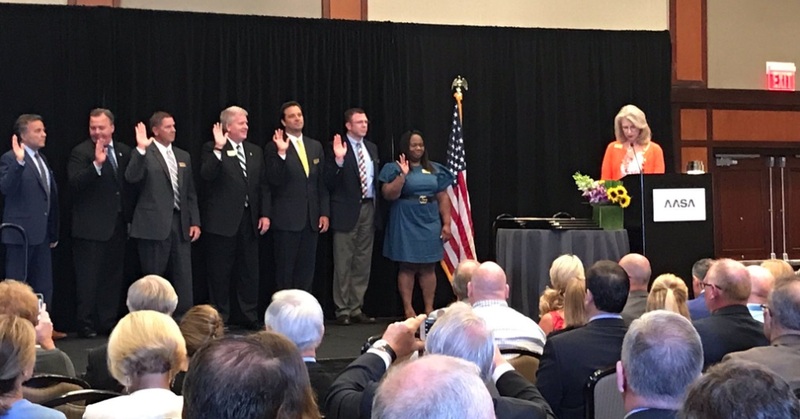 Deb Kerr, superintendent of The Brown Deer School District in Brown Deer, Wis., was sworn in as our president-elect. Superintendent Kerr will be a tremendous asset to our organization and I look forward to working with her in the coming year. 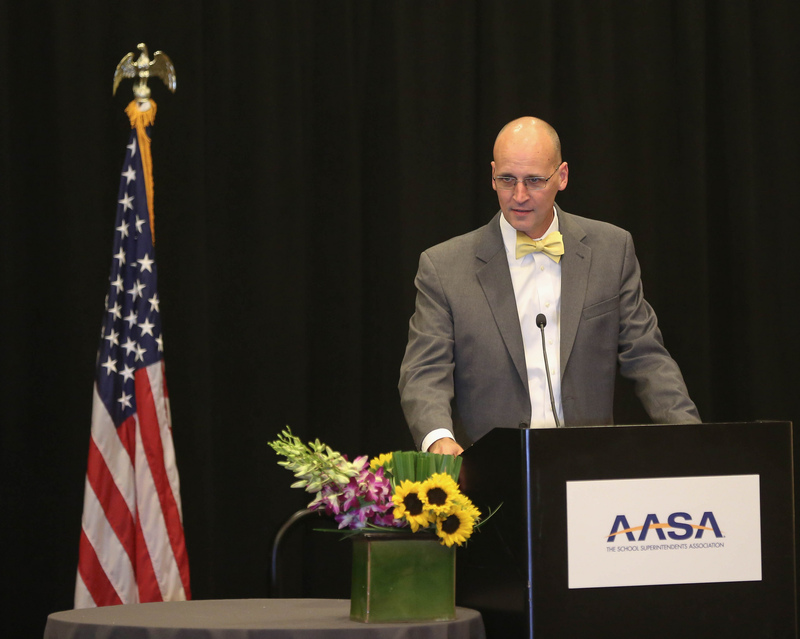 The highlight of our “installation” ceremony was the introduction of Chris Gaines, superintendent of Missouri’s Mehlville School District, as the 2018-19 president of AASA. Chris has been a member of AASA’s governing structure since 2008 and served on the organization’s executive committee since 2014. He has also been a member of the Missouri Association of School Administrators since 2001. He is truly a “champion’s champion.” Throughout the past two years, he has worked to escalate and promote personalized and digital learning. His work has been nothing short of outstanding. A native Midwesterner and someone who spends a lot of his (rare) free time canoeing and kayaking (hence his Twitter handle, @paddlingsupt), Chris is not shy about going toe-to-toe with any “inside-the-beltway” Capitol Hill staffer on the value of public education in order to advocate for his fellow superintendents and, more importantly, the students they serve. It is an honor to say that as president of AASA, Chris is now a lifelong member of the AASA family—which can only benefit public education. I invite you to view our latest video, capturing Chris’s remarks during our installation ceremony. Finally, and on behalf of the AASA family, let me congratulate Gail Pletnick for completing an outstanding term as president. The former superintendent of Arizona’s Dysart Unified School District, when it comes to engaging superintendents on areas of leadership and instilling the utmost important values and ideals for leaders to excel, Gail’s work has been off the charts. Currently serving as co-chair of AASA’s Personalized Learning Cohort, Gail often participates in our Digital Consortium. Immediately following the Legislative Advocacy Conference, she went straight to AASA’s Alexandria office to participate in the National Superintendent Certification Cohort meeting. Gail will continue to serve on our executive committee as immediate past president and will be a valuable asset as our organization continues to serve as the nation’s premier voice for public school system leaders throughout the country. Congratulations to all of the superintendents and school system leaders who joined us in Washington, D.C., as part of our Legislative Advocacy Conference, a very successful event. This entry was posted in Education and tagged AASA, AASA ASBO Legislative Advocacy Conference, AASA installation ceremony, AASA President, Chris Gaines, Dan Domenech, Deb Kerr, Gail Pletnick, Leaders Matter, superintendent, The School Superintendents Association, Washington D.C. by Dan Domenech. Bookmark the permalink.